The Duke & Duchess of Cambridge’s children have as their ninth great-grandfather (through the Duchess) a Halesworth man called Benjamin Fairfax. Turns out he was a nonconformist Minister who lived and worked in the town over 350 years ago. 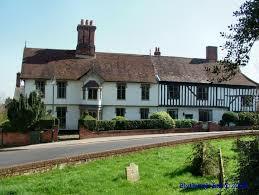 Halesworth born & bred Sir Robert Bedingfield was Lord Mayor of London in 1707. What with the numerous pubs & tap rooms in Chediston St & those in Quay Street, it is thought that there were up to 50 pubs & tap rooms in the town at one time. Now there are 3! In 1835, Durban, South Africa is named in honour of Halesworth born and bred Sir Benjamin d’Urban, governor of Cape of Good Hope. Halesworth was the childhood home of George Lansbury, leader of the Labour party 1931-1935 and one of its founding fathers. His granddaughter is the well-known actress Angela Lansbury. In 1862, PC Tye was murdered in what were the notorious ‘yards’ off Chediston Street – his convicted murderer was the last man to be publicly hanged in Suffolk. The actor Kevin Whateley (Sgt Lewis in Inspector. 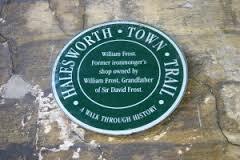 Morse) has an ancestor who was the Rector of Halesworth from 1822-1831. 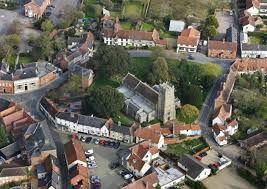 The river was once navigable between Halesworth and Southwold. The ‘Bloomsbury Set’ came to nearby Wissett for their holidays. Cornelius Pedgrift was a local surgeon who came to national attention (notoriety?) when the townspeople helped fund an appeal (successful) against the necessity to register as a practioner under the new Medical Act 1858. The actor Sir Alan Bates opened The Cut Arts Centre and its auditorium is named after him. 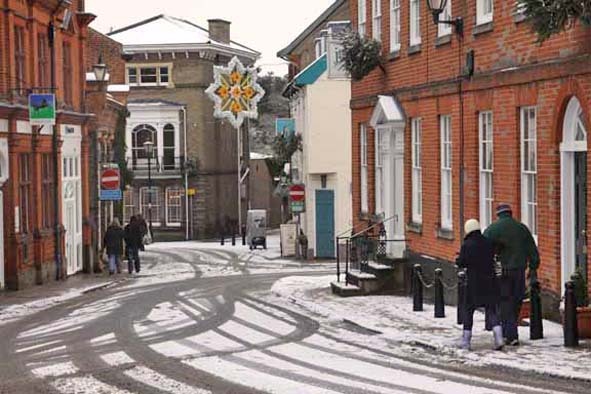 Halesworth is mentioned in the Domesday Book of 1086, at that time known as Healsurda; by the reign of Henry VIII it was known as Haillesworthe. They all mean‘Homestead’. The town has held an outdoor market every week since 1222. Almshouses were built in the 1680’s and were still in use in the 1960’s providing separate accommodation for 12 poor single men and women. CHB Trollope, a clergyman and early 20th C watercolourist, related to the eminent Victorian novelist Anthony Trollope, lived in the town. Number 5 Marketplace, now a private art gallery, is thought to be the oldest house in the town, circa 1350. Hemp was an important local crop for very many years, being grown in nearby fields for the sails & ropes of the Royal Navy.